The Wisconsin Broadcasters Association (WBA), Midwest Broadcast Journalism Association (MBJA), Milwaukee Press Club (MPC), the Association of Wisconsin Symphony Orchestras (AWSO) and the Wisconsin Youth Symphony Orchestras (WYSO) have recognized WPR journalists and hosts for exceptional broadcast and digital service. NPR News & Classical Music Network Director Peter Bryant accepted the AWSO Service to Music Award on behalf of WPR at its spring conference in Milwaukee. 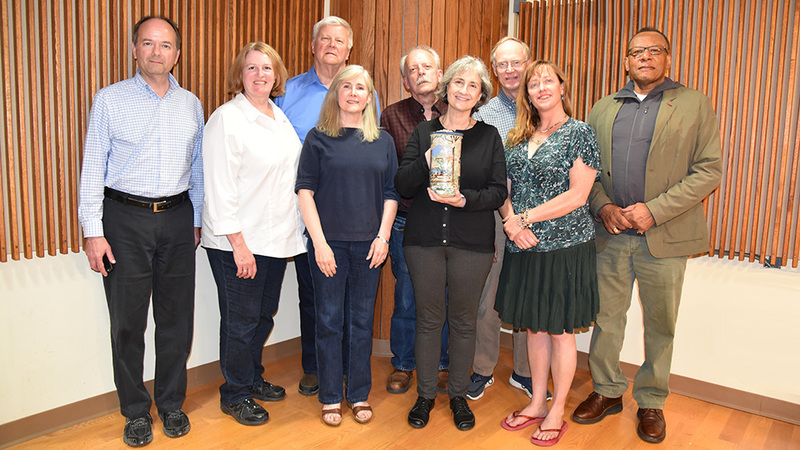 The award recognizes WPR’s "sustained statewide impact on community music organizations over many years and in multiple areas such as education and community outreach." The WYSO honored Norman Gilliland with the Rabin Youth Arts Award for his influence on young musicians in Wisconsin. WPR News, The Ideas Network, "To The Best Of Our Knowledge," WPR's Digital Content Team and WisContext received more than 30 awards for work done over the past year. Highlighting the list were multiple honors for our partnership with the Wisconsin Center for Investigative Journalism, including Gold awards for reporter Alexandra Hall from the MPC. The MPC also awarded Gold to Danielle Kaeding for Best Short Hard Feature Story, WisContext for Best Online Coverage of News, and to the team who developed the new "To The Best Of Our Knowledge" website for Best Website Design. WisContext also received a First Place award for Individual Multimedia Storytelling News from the MBJA. Student broadcasters at KUWS in Superior and WUEC in Eau Claire were well represented with numerous MBJA awards, including First Place in Audio, Spot News and Talk/Public Affairs. Central Wisconsin’s regional program, Route 51, received First Place in Talk/Public Affairs from the MBJA and named Best Radio Show in a medium market by the WBA. "Our listeners reward us every day by tuning in, visiting our website and telling their friends about WPR," said WPR COO Mike Arnold. "It is especially rewarding to be recognized by our fellow journalism and music peers."